No visit to Memphis is complete without a sightseeing tour of some of the city’s most historic streets, including Madison Ave, Beale Street, and the scenic Riverside Drive. Madison Ave, where this route starts, may seem more commercial that scenic, but it’s a great spot to scope out choice bars, restaurants, and lounges to try out later on. Avoid traffic on the wide sidewalk and use it to connect to Marshall Ave, which will swoop you down to the far end of Beale Street. 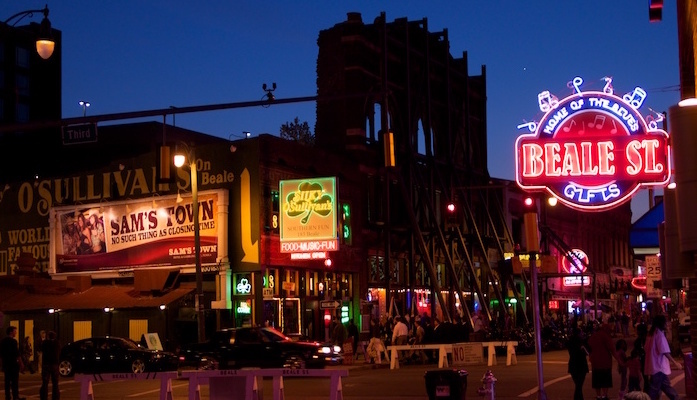 Take a right onto Beale Street and follow it back to the coast, but take your time — there’s a lot to see! This iconic entertainment district is a musical melting pot of performance venues, studios, and dancing, with an eclectic neon vibe. Follow Beale Street past the Music Hall of Fame and the Memphis Rock and Soul Museum, then cut south down South Main Street. When you hit the corner near the Blues Hall of Fame and the National Civil Rights Museum, take West Butler Ave out towards the River Walk. Swing a right and enjoy a long stretch of river views before you reach the start point near Memphis Park. Bonus: these streets are well lit at night. Add-On: Riverwalk and Big River Crossiong, for a longer run.